"On 04.08.2017 at 9.00pm, the TV Show "BIG BOSS", was telecasted on VIJAY TV. The show claimed that it was a complete recording of the activities of a group of people made to live under a closed compound, and they can only leave the compound with the permission of the show producers. 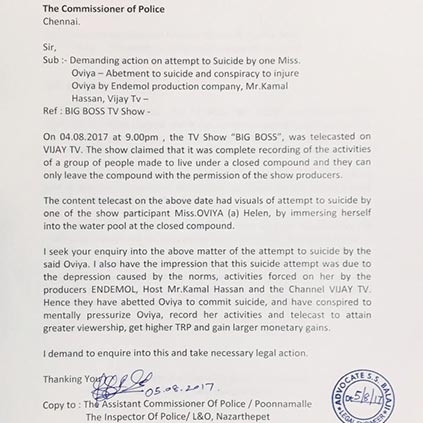 The content telecast on the above date had visuals of an attempt to suicide by one of the show participant Miss.OVIYA (a) Helen, by immersing herself into the water pool at the closed compound. I seek your inquiry into the above matter of the attempt to suicide by the said Oviya. I also have the impression that this suicide attempt was due to the depression caused by the norms, activities forced on her by the producers ENDEMOL, Host Mr.Kamal Hassan and the Channel VIJAY TV. Hence they have abetted Oviya to commit suicide, and have conspired to mentally pressurize Oviya, record her activities and telecast to attain greater viewership, get higher TRP and gain larger monetary gains. I demand to enquire into this and take necessary legal action." Such complaints have become very familiar for Bigg Boss show. But at the same time, it is important to draw a line when it comes to such sensitive issues. We will keep you posted regarding this case. Bigg Boss - It is confirmed: Oviya is officially out! What will happen to Bigg Boss without Oviya? Actor's take! Shocking: Nine stitches for popular actress. What she did next was even more shocking. Leaked Photo: Oviya is out from Big Boss house? Just in: Oviya to leave Bigg Boss! Medical emergency. It's Vijay and Shankar for Mudhalvan 2, People's choice! Oviya's Old Photo That She Has Come Of Big Boss Show Go Viral. People looking for online information on Bigg boss, Oviya will find this news story useful.